This set of Kitchen Pipes is a fine musical instrument with a rich sound. While not as loud as the Highland bagpipes, they have a firm and dignified presence. 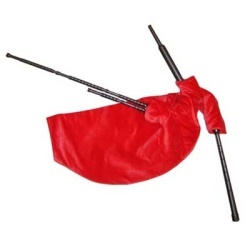 They are constructed of Delrin and come with a synthetic pipe bag and velveteen bag cover. There is a water trap built into the blowpipe. Reeds are Walsh Practice chanter reeds, these are used in the drones and chanter. A long Pipers' Choice practice chanter is used with this set. The top half of the practice chanter is used as the blowpipe, while the bottom is used as the chanter. This offers you two instruments in one, a great practice chanter, and a great set of smallpipes. This set of pipes comes with a soft padded case and a small tutor book with CD.